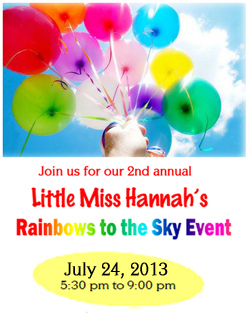 Little Miss Hannah’s “Rainbows in the Wind” Event – July 24th! Only two months until our big July event! Please be sure to join us at Town Square on July 24th, 2013 at 5:30 pm. Picture it…hundreds of colored feathers blowing in the wind, carrying messages of love to those children, family, and friends that have passed away. On July 24th, you can join our celebration by creating your own messages of love while enjoying music, dancing, and activities for your entire family.